When you walk out the door, there is no denying that summer is here. At least that is true here in the Midwest. Summer means that the kids are out of school, and you are likely going crazy by now trying to come up with activities to keep them entertained throughout the day. Well, here’s one you may not have thought of; go out for a picnic. 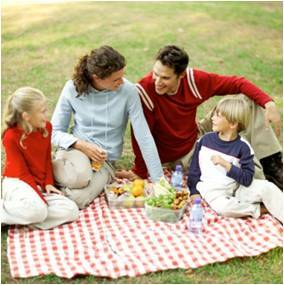 Picnics provide a great opportunity for families to spend time together. Everyone can get involved in preparing the picnic, transporting the food and enjoying the fun! Here are 5 tips to ensure that your picnic is a big hit with your kids! Pack a well balanced meal – This is important to remember when preparing any meal, especially for your children. Be sure to include a protein, grain, veggie, fruit and dairy. Tip: Freeze some mixed berries ahead of time. They’ll make a great dessert to satisfy their sweet tooth and keep them cool! Take plenty of H20 – Our bodies are composed of 60-70% water. Therefore, it is important that we consume plenty of H2O, especially when it is hot outside. Make it a goal that everyone consume 8 oz. of water each hour while you are out in the heat enjoying your picnic. Keep the cold stuff cold – Always remember food safety! To reduce the risk of sicknesses due to bacteria, cold food needs to remain cold throughout your trip. For any non-perishable items, a picnic basket is great. However, you’ll need to keep the cold items in a cooler with ice. Tip: Reserve the bottom of the cooler for the cold items. They’ll stay cooler down there. Think about the extras – Of course you’ll need food on your picnic. But, what else do you need? A couple things to take would be bug spray and sun screen. Always make sure that everyone is wearing sun screen when you are going to be spending time out in the hot summer sun. 5. Take a long a good ground-cover – Don’t you want to be comfortable? Sometimes, grass can leave your legs a little itchy. A good ground cover will keep you clean, and itch-free. At NCES, we love helping you keep your family happy and healthy! If you ever have any questions, visit us at www.ncescatalog.com, or on Facebook or Twitter. You can also email us at info@ncescatalog.com or Chat Live with our Dietitian! Plus, be sure to check out our new MyPyramid Handouts for Adults, Kids and Tots.